More than 330 experts from around the world attended the event to discuss how we can best collaborate to address knowledge gaps and ensure that the best evidence is informing action, policy and the public on the lead to the IWT 2018 London Conference. More than 200 people also followed key sessions on our live stream. A large delegation of the Evidence to Action organisers and presenters were also invited to attend the UK government’s London Conference on the Illegal Wildlife Trade and further represent research to help close the divide between evidence and policy. A summary of the research evidence on the trade’s scale, impacts and complexity, the remaining evidence gaps and how we can move forward efficiently following the events, can be found in the Evidence to Action Briefing Note (https://osf.io/preprints/socarxiv/35ndz/). This briefing, addressed to policy makers and practitioners, is part of the 2018 Evidence to Action: Research to Address Illegal Wildlife Trade event programme, organised by five of the UK’s most active IWT research institutions, to support the London 2018 IWT Conference. The UK government hosted an international conference on illegal wildlife trade (IWT) in London on 11 to 12 October 2018. This declaration summarises the conclusions of conference. It notes the actions adopted by and the commitments made by the countries in challenging the illegal wildlife trade and its effects. Follow @IWTnet on Twitter or join our mailing list for the last update about our 2019 IWT event in Asia. Email iwt@zoo.ox.ac.uk for questions about our events. The 2018 IWT event was jointly organised by Oxford Martin Programme on the Illegal Wildlife Trade, BIOSEC University of Sheffield, Lancaster Environment Centre, the Durrell Institute of Conservation and Ecology, the Zoological Society of London. The official hashtag were #IWT18 and #Research4IWT and you can download the event flyer for more information. On 11th-12th October 2018, the UK Government hosted the fourth major Heads of Government conference on tackling the illegal wildlife trade (IWT), the London 2018 IWT Conference. One of its central aims is to build coalitions between sectors, including researchers, private sector, NGOs, civil society (including the media) and governments. 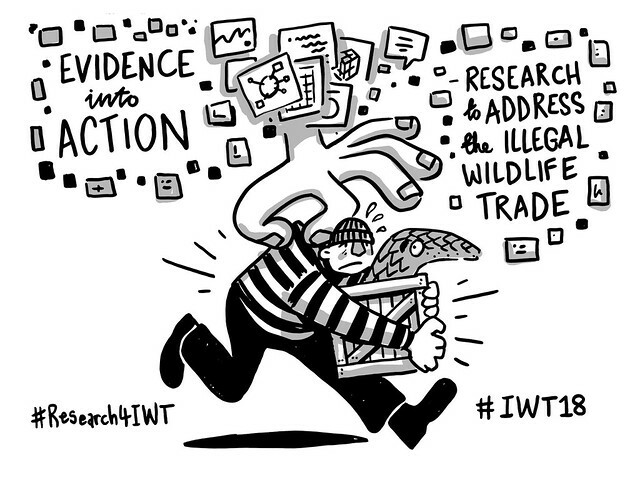 To support this aim, five of the UK’s most active IWT research organisations organised a novel event entitled ‘Evidence to Action: Research to Address the Illegal Wildlife Trade’ which was held at the Zoological Society of London on October 9, 2018. The event brought together researchers and end-users from across all sectors working on IWT, to find new ways of working together to tackle this complex topic. Research plays a central role in finding real-world solutions to the challenges posed by IWT, in ways that are evidence-based, and effective. This Evidence to Action event covered the full range of areas in which research can support action, explicitly reaching across IWT stakeholder groups to learn from experience and build collaborations that can inform policy and action. We aimed to be inclusive and sought a diversity of approaches and perspectives. More info on our guest panellists here. More info on the visual presentation here. More info on the workshops here. More info on the panel discussions here.